Have you ever looked at the racks of beautiful threads and wished they were actually spools of embroidery floss? We have, which made me wonder what would happen if we tried hand embroidery with thread designed for a sewing machine. The very idea felt like breaking the rules, so if you're an embroidery purist this article may make you uncomfortable. And we understand. Aurifil is an Italian thread company best known for their high quality sewing threads. In recent years they added a line of embroidery floss called Aurifloss. We received a few spools of thread in the different weights and types they manufacture, and thought this was a good opportunity to test out new idea. The short version of all of this is, you can use sewing threads for your hand stitching! The result and process is much like working with embroidery threads, and as with other threads, the different types have unique looks. Take a look at these stitch samples then apply the idea to your own embroidery! For the sake of comparison, let's start with a sample stitched with embroidery floss. This was worked with three strands of Aurifloss, which we find to be a little finer than DMC's standard stranded floss. We often work with three strands, so that's what we did for this example. However, because this thread is a little thinner, you could very easily use all six strands for general embroidery. As this is the most common type of thread for embroidery artists to work with, consider this the baseline with which to compare the other threads. Sewing threads come in different weights, which often are related to their intended use. The weights are also used simply to create a different look in the stitching. A larger number indicates a thinner thread and the basic thread we typically think of would be 40wt or 50wt. For our testing, we went for a slightly thicker thread: 28wt, which is recommended for machine embroidery Just feeling it, we thought this might be similar to a single strand of embroidery floss, but it's actually a little thicker. Maybe even a lot thicker, which tells me that using finer thread would be a good option too. To stitch the sample, we cut off three strands of the 28wt thread, held them together and threaded our embroidery needle. Of course, all threads are different, but what made this really shine was that it has a smoothness and sheen to it that most floss lacks. The look is similar to perle cotton but less chunky. We'll be using this thread again. Switching to an even thicker thread, next we embroidered with 12wt thread, designed for decorative sewing/quilting. Embroidery is a form of decorative sewing, so it was no surprise that this one worked well. The weight of this could be compared to fine weight perle cotton. Sulky makes a product in the same weight, and they compare this to two strands of floss. We embroidered the sample with just one strand or piece of 12wt. Similar to the thinner thread, this has a beautiful shine to it and was easy to work with. This is clearly a good choice for embroidery. Finally, another product that Aurifil makes is a wool thread. It's recommended for machine applique and quilting, but also for some hand work. And it truly is ideal. As soon as we saw this, we thought about crewel work and wondered how it might compare to the wool threads designed for that type of embroidery. While it's finer than most of the crewel threads and handspun wool floss we've encountered, it would definitely work. Again, we worked this example with just one strand. The stitching is soft and a little fuzzy, just as you would expect wool to be. We also tried using this for some fill stitching, and the result was beautiful. Don't be afraid to try a thread that looks interesting to you just because it's not designed for embroidery. It's okay to stitch outside the skein! 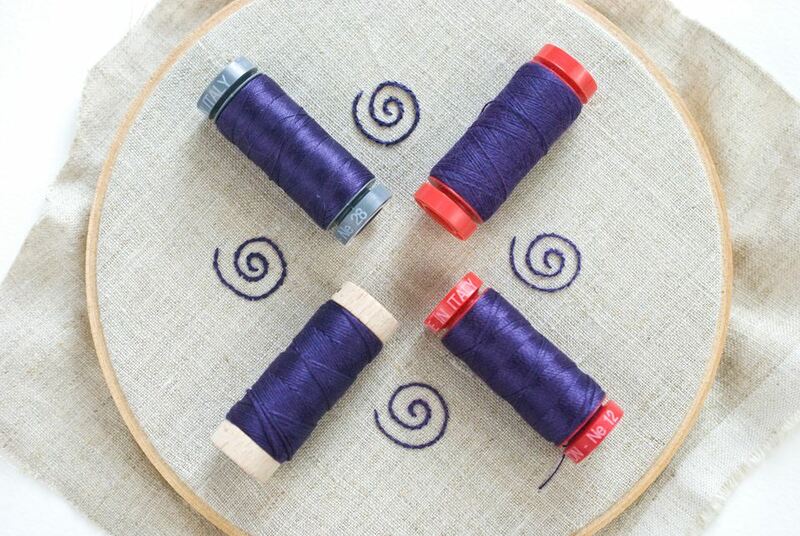 Experiment on your own and then try combining a few different kinds of threads in a single piece. The variety of weights and textures, even if they are all the same color, will add a new dimension to your embroidery.